Yesterday afternoon a fire started on Cold Springs Drive near Nederland, Colorado. The conditions are ripe for it – record temps, extremely low humidity and lots of fuel. As of the last I’ve heard, the acreage burned was about 226 acres. We know structures have burned – the report is at least 4 – but we don’t have confirmations of an exact number. A number of Nederland area subdivisions have been evacuated – Cold Springs, Bonanza Mountain, St. Anton’s Highlands, Silver Springs – and the western area of Sugarloaf Rd is on pre-evacuation alert. A pre-evacuation means the affected households should be prepared to leave at any time. If you feel unsafe, leave immediately – do NOT wait for an evacuation notice. Hurricane Hill – between Hwy 119 and Ridge Rd. Cold Springs Road – between Hwy 119 and Ridge Rd. 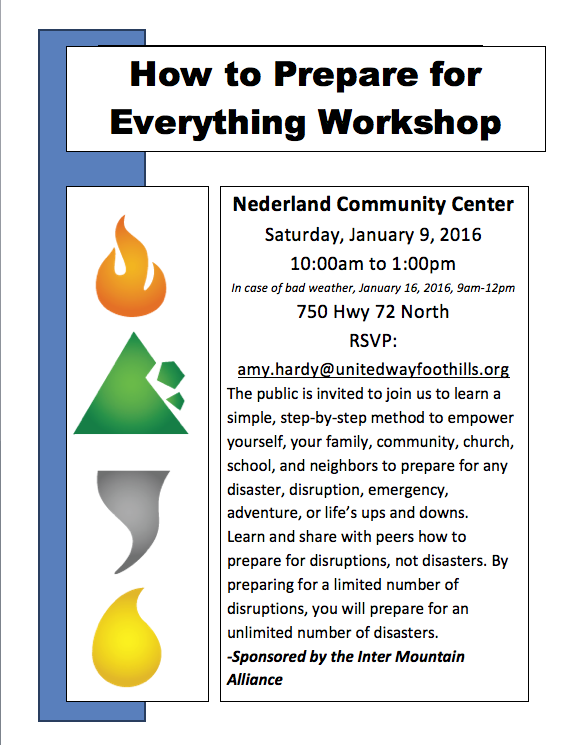 The Inter Mountain Alliance is sponsoring a “How to Prepare for Everything” workshop to take place on Saturday, January 9th from 10-1pm in the Ned Community Center. This workshop is not about disaster preparedness per say but instead about how to prepared for disruptions in our lives. This is a hands on workshop that will provide take home tools to support our unique families in preparedness for the disruptions that life brings and how to support our unique living situations. This workshop will be taught by Aaron Titus, the Co-chair of the BoCoVOAD. I have attached a flyer for you to share with your community members. This workshop is open to the public and all are welcome. Let me know if you have any questions. See you all soon! If you want to enjoy some fantastic food, wine, poetry and wit this might be the best place to be in the mountains on a Friday night. 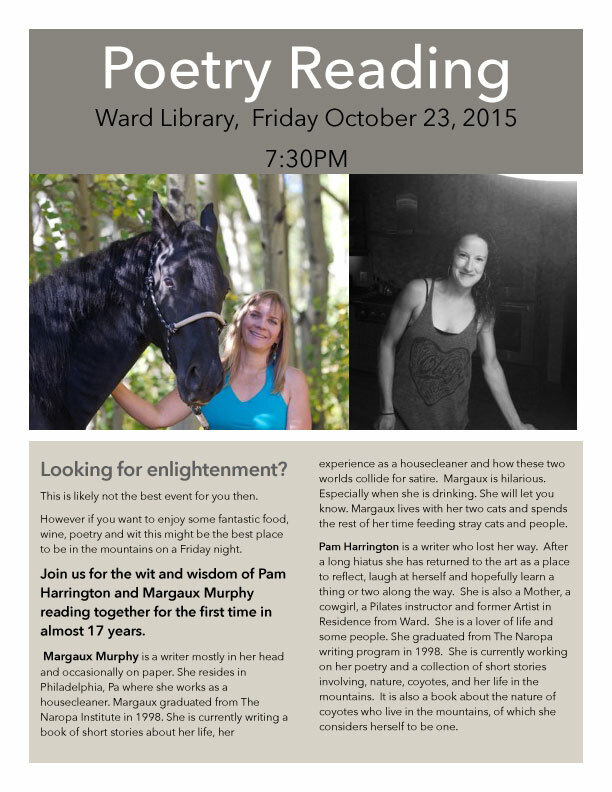 Join us for the wit and wisdom of Pam Harrington and Margaux Murphy, reading together for the first time in 17 years. 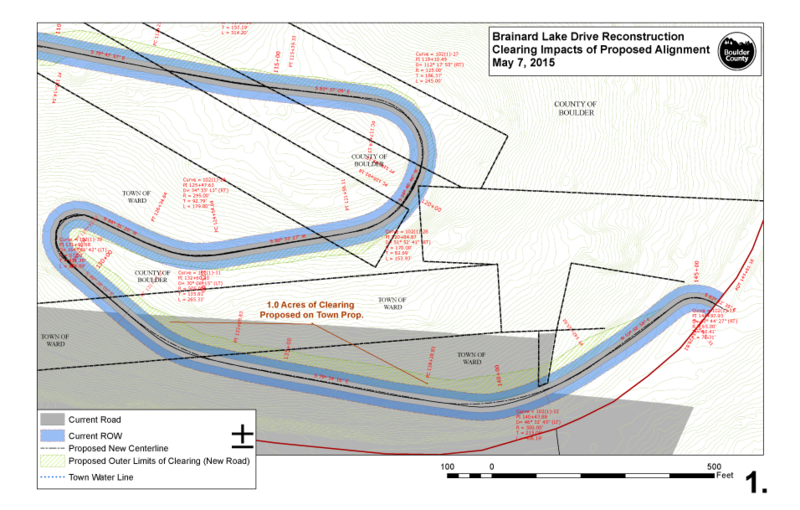 There are open house meetings planned to discuss the 5 possible designated shooting areas that meet preliminary criteria as safe and sustainable. Open house meeting means that there is no presentation, just tables with information and people to talk to – so you can come and go as you please. Peaceful Valley Resort (between A’park and Ward). This decision impacts our community, please plan to attend one or several of these meetings. 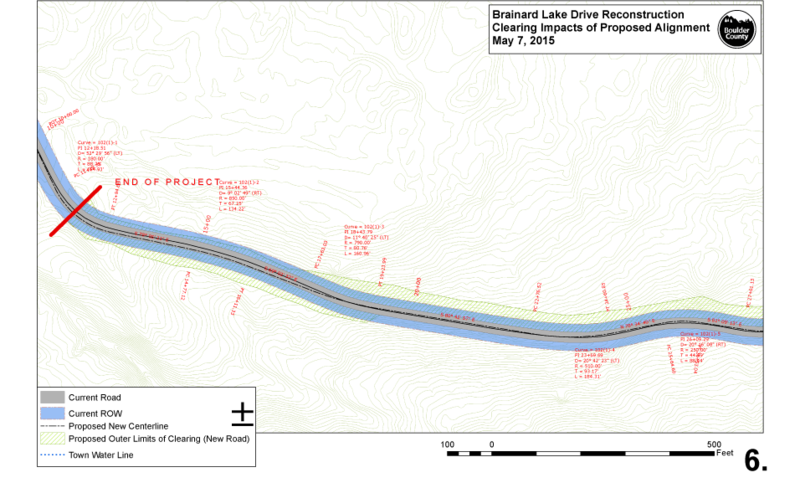 Boulder County, Colo. — Boulder County Transportation’s Maintenance Division will begin work to install a concrete culvert and conduct roadway and shoulder repair operations on upper Lefthand Canyon Drive just west of Sawmill Road on Tuesday, June 23. Construction operations will be conducted from 7 a.m. to approximately 4 p.m., Monday through Thursday, until mid-July, weather permitting. 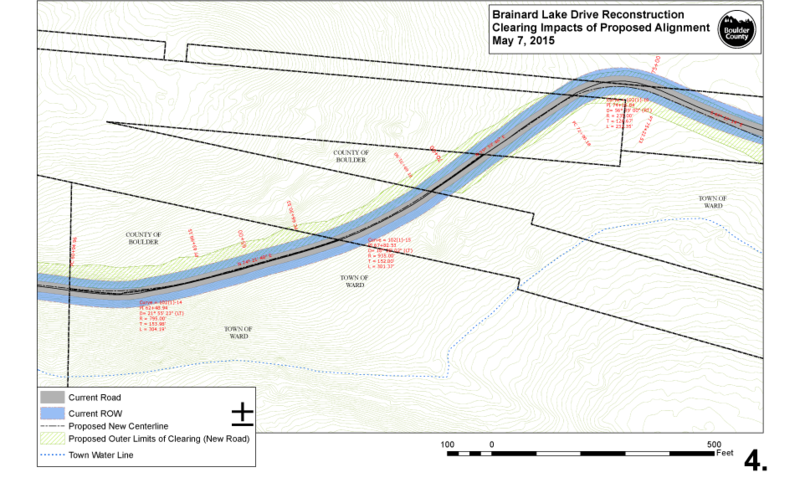 During the first two days of construction, June 23 and 24, 30-minute travel delays for both motorists and cyclists can be expected. Travelers are encouraged to use alternate routes on these days. 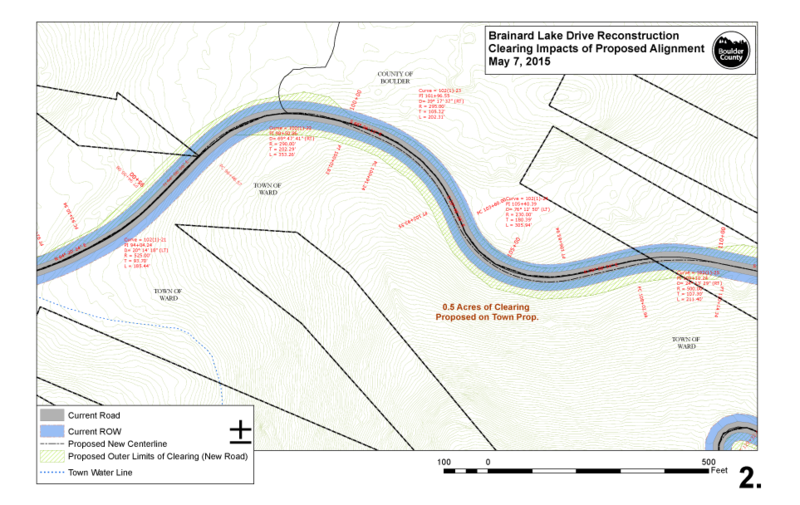 After June 24, Lefthand Canyon Drive will be reduced to one lane of traffic control-assisted access during working days and delays will be kept to a minimum. Access for emergency responders will be maintained at all times. The work zone will remain open for all users Friday through Sunday. 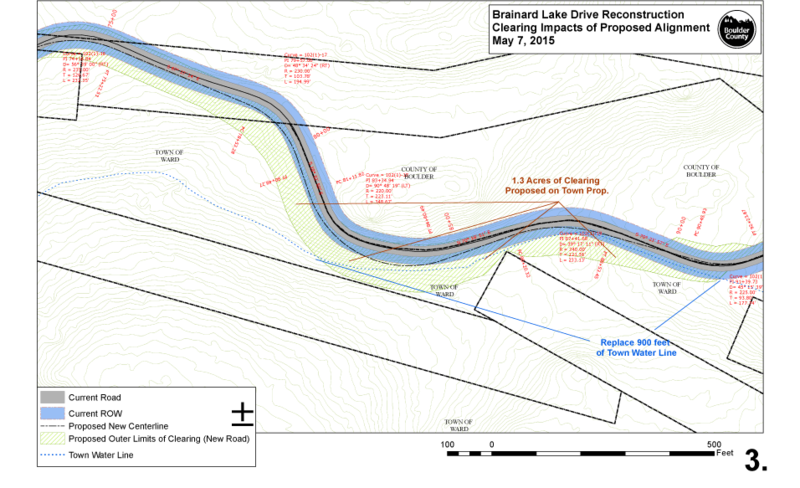 This project is in anticipation of planned roadway resurfacing work that will take place later this summer at a date to be determined. More information will be provided about that project as soon as dates and travel impacts are known.